Hello friends, hope you all are fine and enjoying good health. Today’s post is my first post on LabView Software. 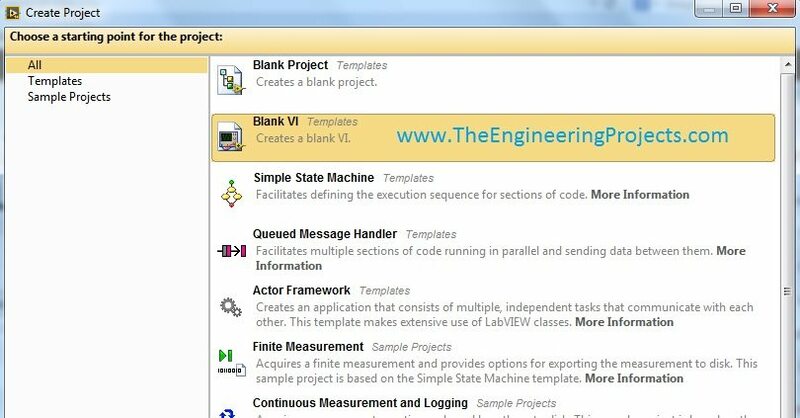 I have worked on LabView quite a lot in past but these days I am continuously working on LabvView so I thought to write some tutorials on it. 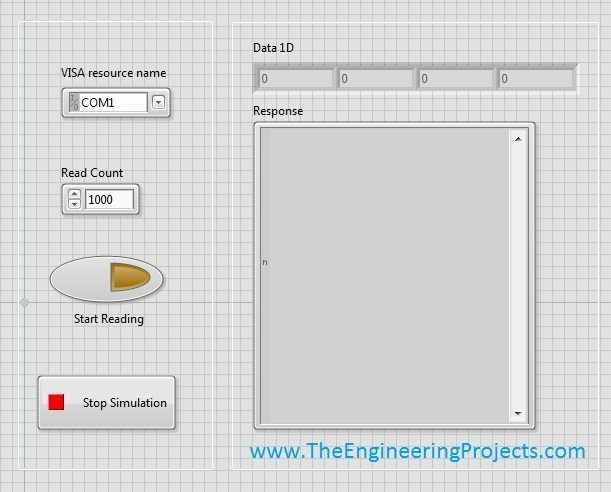 In today’s tutorial, I will explain in detail How to get continuous data from COM Port in LabView software. LabView is a very handy tool for the engineers. One can easily plot graphs and can work on different hardware modules with it. One of the best feature of LabView is its extensive help desk. There are many examples present in it which are ready to run and can help a lot, moreover their online is also very extensive. I got into many problems while working on it and I never get stuck, I just searched online and got the solutions for my problems. So, my suggestion is, if you are working on LabView then give Google a chance to help you out, if you stuck in something. Let’s start today’s post, in today’s post we will receive data from serial port and show it in LabView software. 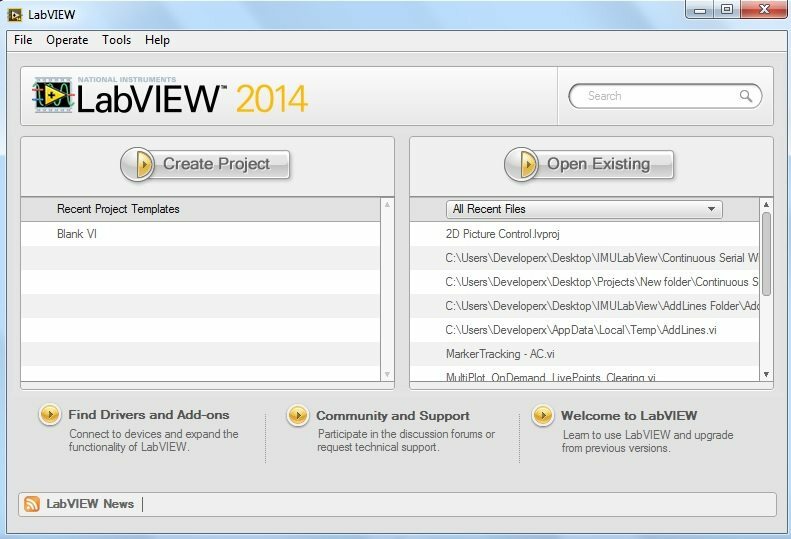 In order to do so, first of all you need to download LabView software, you can easily download it from their official website. They offer a trial period of around 45 days for the students and after that you have to buy it. Now, follow the below steps carefully and if you find any trouble anywhere, let me know in comments and I will try my best to sort them out. First of all, you need to download the NI VISA driver. NI VISA driver is used for serial communication, without downloading this software you can’t communicate with the serial port of your computer in LabView. LabView has extensive list of drivers, whenever you want to communicate with any hardware in LAbview then you have to download its driver, NI VISA is the driver for communicating with serial port. After downloading this driver, install it and now run your LabView software. I have given the complete working vi to download at the end but I suggest that you should design it by yourself so that you learn how to design. Now, click on the Create Project Button and the below Window will pop up. Now click on the Blank VI Template and click Finish. A blank vi will open up, we will design the complete project in this vi. These are two windows, one is called the Block Diagram, where we will place all the components and the second one is Front Panel, where user can interact with LabView i.e. the Serial data coming will be displayed in the Front Panel. Another small window will also be there, this window is used for getting blocks. In this vi, we are receiving data from Serial port and then separating it on the basis of “,” character and then placing it in a Data 1D and as well as in Response box. Before running the vi, first of all select the COM Port from which your data is coming. Now click on RUN button in top toolbar, but still you won’t receive anything, now hit the Start Reading button and you will start receiving the data, as shown in the below figure. If you don’t select the correct Com Port then it will give error and won’t run so select the correct COM Port name. Now, the COM Port I am using is COM5 and you can see Start Reading button is also ON. Response is showing the complete data whatever is coming from the Serial Port, while the Data 1D is splitting the data and showing each data in each box and the separation character I selected is “,” (comma).That’s all for today, now play with the vi and I hope you will find it really amusing. In order to download the complete working vi click on the below button. In the next post, I have discussed how to Display Serial Data on Real Time Graph in Labview.Displaying data on graph is usually required in most of the projects. So have a look at it. Hey…..greetings from México, can you suggest any book to lear LAB-VIEW. Search online, you will find a lot of tutorials on Labview. moreover, also check the Help of LabView its quite awesome. Thanks. same. this link is broke, please fix. thank you for this good explaination. 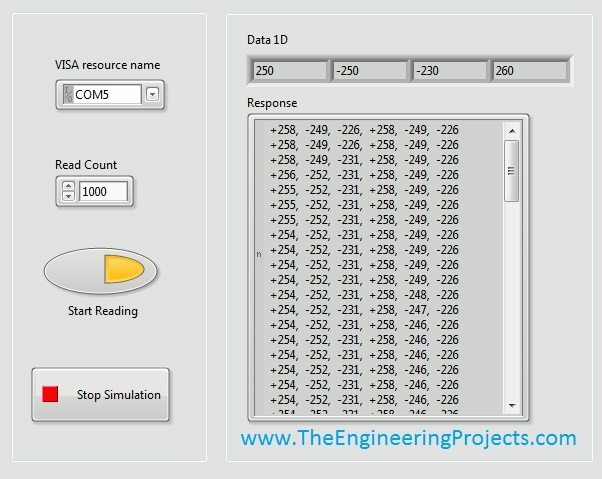 when i run the labview program it runs correctly,but when i wanna change some values from the coms,there is no response and give me error…………so if i want to insert a new values,i must stop the run simulation and the program does not work online. yeah, add me on skype and we will discuss it in detail. My skype id is theenggprojects. The download link for this vi simply returns me to the home page. I’ve tried the link in Chrome and in IE with no luck. I think the link’s broken, I will check it out. Thanks for informing. You should connect some COM Port with your computer that will appear in this box. Content is good.I am using the same procedure to analyse the output of the microcontroller PIC 16F628A by feeding the output signals Rx & Tx from microcontroller directly to the pins 2 & 3 of Max-232 and then into the read buffer, now its not showing any error but meanwhile i am not able to view the result (as indicated in the attachment).So,please suggest me accordingly. Bro add me on Skype and I will check your hardware and will let you know the problem. My skype id is theenggprojects. I downloaded your VI and it’s quite nice. However, i’m trying to read on 3 sets from the index, but the vi read only from index 0, I was wondering why there’s noting on the other indexes 1 and 2. I’m reading from COM3, also my code it good, and i’m trying to read a force of my hand ,then I want to do some extra calculation to read it in different measurement. I noticed that i may need to do extra steps to read my calculations. any idea will be helpful. Hey Nasir, There’s some problem with the link for the VI as well as the one for the next tutorial.. It says service unavailable .. Could you please fix this ? Or maybe send me the VI via email ? Hey Nasir, Love the tutorial. Can you please fix the link to download the VI ? It takes me to the homepage and does nothing. Or if possible, can you email it to me ? same here It takes me to the homepage and does nothing. hello, may I have your VI file. My email is ntr_hieu@yahoo.com. I cannot download it from your link. Many thanks.